VATICAN CITY (CNS) — A lifestyle that is environmentally ethical cannot be “schizophrenic” — for example, by showing more care for animals and forests, than for the plight of people, Pope Francis said. 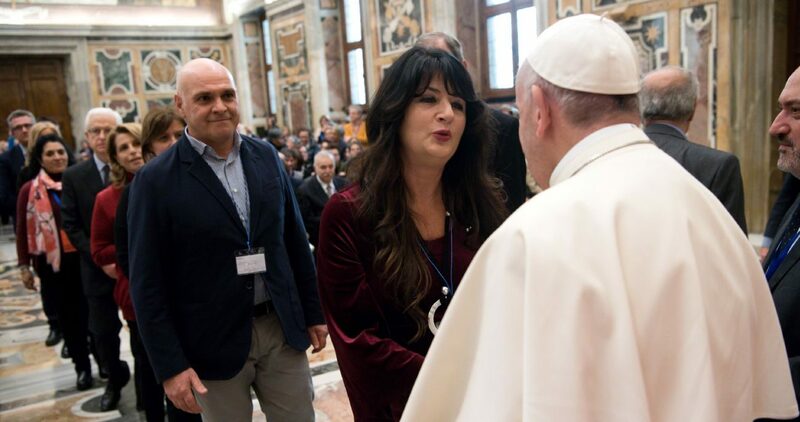 A green lifestyle must be consistent and complete, driven by a love for God the creator and all of his creation, the pope said in a speech Jan. 5 to the Italian Association of Catholic Teachers, which held its national congress in Rome in early January. The elementary school teachers must help children from a young age understand and practice an environmentally ethical lifestyle that must not be “schizophrenic,” that is, a kind of disconnected concern for, as an example, “taking care of animals in extinction, but ignoring problems facing the elderly. No. Or defending the Amazon rainforest, but neglecting the rights of workers to have a fair wage,” he said. This approach demands teaching the importance of personal responsibility, not bombarding the children with slogans or catchy commands that someone else will have to carry out, he said. Teach children to have an enthusiastic appetite for “experiencing an environmental ethics that stem from the choices and behaviors in daily life,” he said. The pope also encouraged teachers and schools to rebuild a new alliance with families that mutually supports and strengthens each other. The educational alliance or “pact” that once existed among the state, schools and parents unfortunately “is broken” and must be repaired, he said. Since constructive collaboration no longer comes “naturally,” plan and design a way for it to happen, even with the help of experts in education, said the pope, who used to teach at a Jesuit high school in Buenos Aires. “But even before that, foster a new ‘conspiracy’ — and I am fully aware of this wording — between teachers and parents,” becoming jointly responsible accomplices to promote the well-being of children, he said. The challenge is to work together to teach kids to be open to and interested in what is around them, he said. They need to be “capable of caring and tenderness — I am thinking of bullying here — free from widespread fallacies” that claim the only way to be worth anything is “to be competitive, aggressive and tough toward others, especially toward those who are different, foreign or seen as being an obstacle in some way to one’s personal success,” he said. “Unfortunately, this is the ‘air’ our children often breathe,” he said. The remedy is to give them a “change of air” that is healthier and more humane, he said, which is why it is important teachers build a new alliance with parents. Help kids see others as brothers and sisters to be respected and as worthwhile in getting to know “with their past, their virtues and defects, assets and limits,” he said.